Congratulations to NSGP graduate student Alexis Tolliver, who was awarded an NSF Graduate Research Fellowship, and to Belinda Mahama, who was awarded an Honorable Mention! Alexis will use a novel method of neuromodulation – bioluminescent optogenetics (BL-OG) – to understand the mechanisms of homeostatic plasticity during normal development and during hyperexcitable states, using the developing brain of Xenopus tadpoles. Belinda will be dissecting the neuronal circuitry and molecular mechanisms that drive recovery sleep after deprivation in C. elegans. 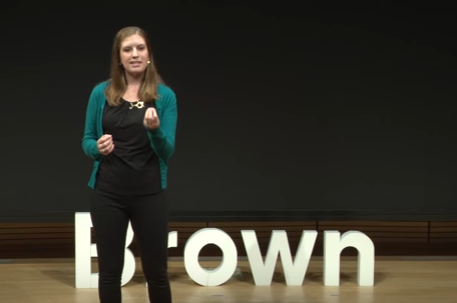 Backed by the Brown Institute for Brain Science and organized by a neuroscience postdoc, the weeklong series of talks, film screenings, art shows and fairs aims to make brain research fun, educational and accessible. 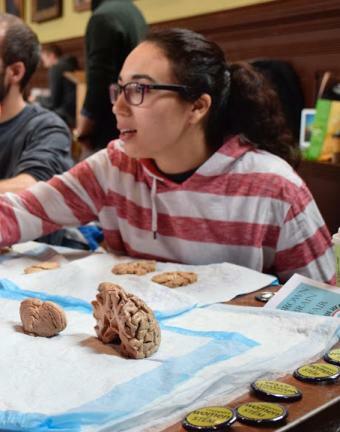 The Brown Brain Fair, part of Brain Week, offers kids and adults alike the chance to learn about brain research with games and fun demonstrations. Photo courtesy of the Cure Alliance for Mental Illness. Many of our Brown Neuroscience Graduate Program students attend and present at the annual Society for Neuroscience meeting. And, all first year NSGP and Brown-NIH GPP graduate students attend the meeting. Pictured here are speakers from an SfN nanosymopsium on ALS, which included several Brown graduate students in Neuroscience mentors laboratories, along with their collaborators. Pictured from left to right: Joshua Whitt (Bron post-doctoral fellow), Joan Koh (MGH), Aaron Held (Brown MCB), Veronica Ryan (Brown NSGP), Amanda Duffy (Brown NSGP), Saba Baskoylu (Brown NSGP) and Veronica Ryan (Brown NSGP). Doctoral degrees awarded at Brown’s Commencement, May 2017. Congratulations to Eric James, Arielle Nitenson, Patrick O’Hern, Dani Rubinstein, Laura Sciarra and Rahilla Tarfa. NSGP graduate Justine Allen’s report on cuttlefish fighting appeared in American Naturalist recently (http://www.journals.uchicago.edu/doi/pdfplus/10.1086/692009) and was highlighted in the New York Times this week. 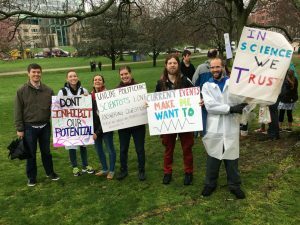 Faculty and graduate students from the Neuroscience Graduate Program, as well as their friends and families, were enthusiastic participants in the March for Science. The rain didn’t stop us from marching in the Providence, RI or Boston, MA. (Pictured: NSGP graduate students Nate Snell, Valerie Estela, Megan Leyer, Torrey Truskowksi and husband Chris, and Alastair Tulloch. Torrey Truszkowski presents for Research Matters!